I spent a lot more time in the kitchen today than what I have been at my new job. 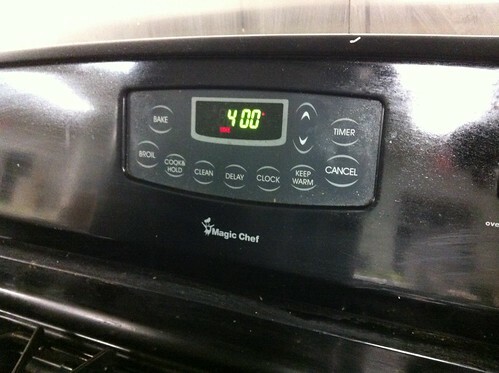 I mentioned something to one of the chefs about how I noticed he never sets a timer and I have to use one always. He said that after years of professional cooking, he just knows when to go back and check on the various foods he has cooking all at the same time. So then I said something along the lines of, "I mean, it's difficult to keep track of time since the digital clock on the oven is stuck on 4 o'clock." "Hey, Jeannette, in case it ever comes up at your house.....you should know that four-zero-zero means four hundred degrees, not four o'clock."